In late 1942, Japanese high command ordered troops to be transferred from China to New Guinea, where an Allied offensive was expected, and as a fall back following the Japanese defeat at Guadalcanal. The Japanese 51st Division was to reinforce Lae and 6000 troops were to be transported on eight transports and eight destroyers. The Japanese began their movement under the cover of tropical storms, which struck the Solomon Islands region in late February 1943, and allowed the convoy to travel undetected for several days. A patrolling American B-24 first reported sighting the convoy, which over the next two days came under fierce attack by American and Australian aircraft, which succeeded in sinking all eight of the Japanese transport vessels and four of the eight destroyers that made up the convoy. 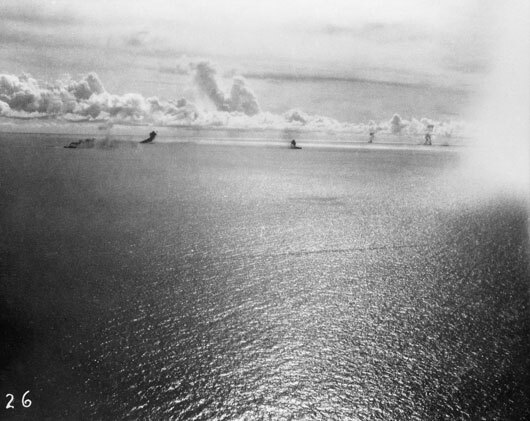 At the time, General Douglas MacArthur, Supreme Commander of Allied forces in the Pacific, proclaimed the Battle of the Bismarck Sea “the most decisive aerial engagement” fought so far in the South West Pacific region. It has been estimated that somewhere in the region of 3,000-5,000 Japanese troops were killed in the battle, for the loss of three Allied bombers and two fighter aircraft. A single RAAF Beaufighter aircraft was lost in the attack. 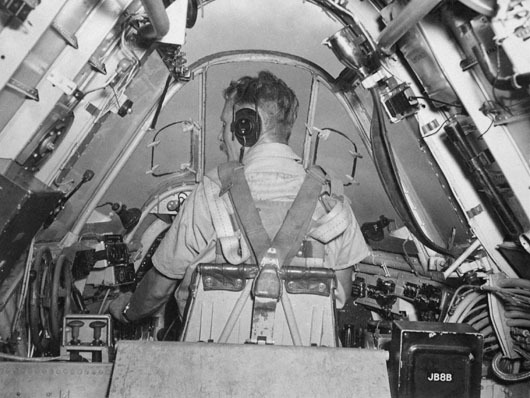 Flight Lieutenant E.M. Ball at the controls of his 30 Squadron Beaufighter during a raid on Witu Island in the Bismarck Sea (AWM P01335.008). 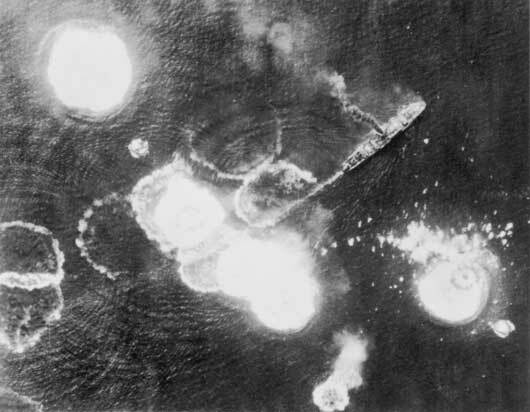 Allied air forces attack Japanese ships during the Battle of the Bismarck Sea (AWM 128159). Enemy shipping under attack by Allied aircraft in the Battle of the Bismarck Sea (AWM 141996). 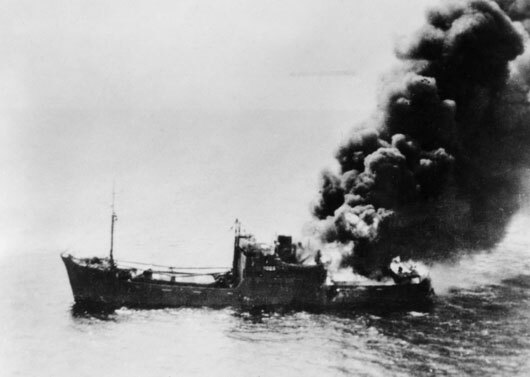 Japanese shipping on fire after an attack by Beaufighter aircraft of 30 Squadron RAAF (AWM P01275.010). 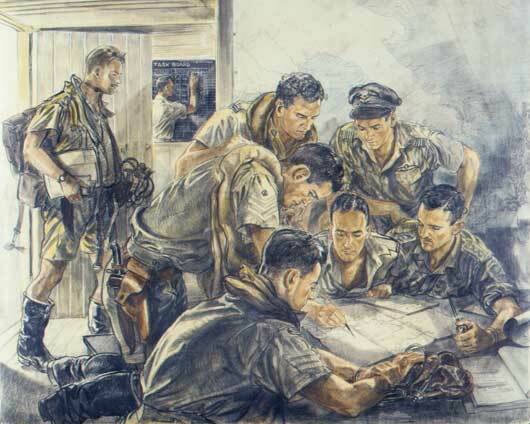 Roy Hodgkinson, "Interrogation scene (Squadron Leader Cuthbertson Learmonth, Captain Ray Hodgson, Flying Officer Harold Rowell, Flying Officer Vernon Hunt)" (AWM ART22744).